PLDT and Globe agreed to reduce the charge cost of per minute interconnection rates. A few days after the President Rodrigo Duterte uttered his affirmation of inviting foreign companies to join in. PLDT/Smart and Globe settled to lower down their interconnection rates for voice calls. President Duterte encourages foreign players to fix the ailing services of the current telecom industry in the country. In their statement, PLDT Director of Regulatory Affairs and Policy Office Ray Espinosa announced that starting on January 1, 2017 the interconnection rate between PLDT/Smart and Globe will only be P2.50 per minute. It is much less compare to the current P4 for landline to mobile and also P3 for mobile to landline. PLDT Chief Revenue Officer Eric Alberto stated this price reduction will not affect the present system connection of two giant telcos. Ensuring that every subscriber will be accommodated with a better network services. At first, it was Pres. Duterte demanded PLDT and Globe to fix their services, failing and he will allow foreign companies to enter the telecom industry in the Philippines. During this event, PLDT and Globe discloses some of their ongoing projects to boost the country's internet connection. 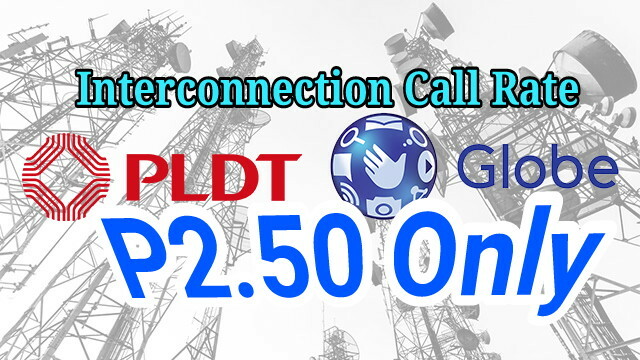 Thank you for reading P2.50 Call Per Minute Between Globe and Smart posted on the website Kwentology if you want to redistribute this article please include the link as the source. Have some kuwento to share? Contact us!